Speaking to the Knesset’s Foreign Affairs and Defence Committee, the IDF’s Military Intelligence chief Gen. Herzl Halevi said that the deteriorating economic situation in the Gaza Strip could lead to a further conflict. Although there has been periodic rocket fire from the Gaza Strip into Israel since Operation Protective Edge in 2014, the ceasefire which ended the conflict has largely held firm. However, Halevi told the Knesset committee that, “The humanitarian condition in Gaza is progressively deteriorating, and if it blows up, it’ll be in Israel’s direction.” He said that Hamas has no interest in a conflict at this point, but that worsening conditions increased the prospect of violence. During the past year, Israel has introduced a range of measures meant to ease movement in and out of the Gaza Strip, in order to aid reconstruction. These include an increased number of entry and exit permits to Gaza merchants and facilitating the export of significant Gaza produce to the West Bank, an important market for the Gaza economy. However, during the same period, numerous attempts to smuggle illicit goods into Gaza have been prevented, including components for explosive material, rocket-building materials, sulphur rods and electronic welding devices. 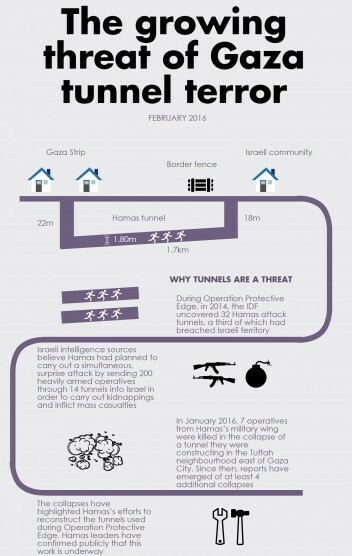 Hamas is thought to be rearming, replenishing its arsenal of rockets, while it openly admits to rebuilding the complex network of tunnels designed to attack Israel. According to one unnamed MK, during his presentation, Halevy also said that “the army is concerned about what could follow” in the West Bank when Palestinian Authority President Mahmoud Abbas is no longer in power “especially because there is today no natural successor,” suggesting an attempted Hamas power grab. Meanwhile, in a separate development, the Shin Bet security agency released figures yesterday recording the number of terror attacks in 2015. It revealed the highest number of attacks since 2008, leaving 28 people dead and 239 injured. The report noted relative quiet in Gaza, but that Hamas is using the opportunity to rebuild its military capabilities.